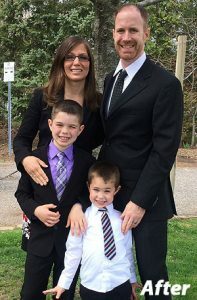 Kristina: Life has always been hectic with 2 young kids, their activities and full time jobs. My job has taken a toll on me physically, mentally, emotionally and spiritually and, at times, left me in a dark spot with nothing but food to comfort me. I am an emotional eater and will always struggle to control that but I am much better at recognizing the signs of stress/anxiety and now implement other things to help with that. Jon always had good metabolism, but he also gained weight and together we became sedentary. In January 2009, I was diagnosed with Hypothyroidism and then followed PCOS in April 2015, Endometriosis In October 2015 and Post Traumatic Stress Disorder in April 2016. I had also struggled with previous injuries to most of my major joints and was constantly achy. I had become a very unhealthy and unhappy person and I had little self-confidence. Jon: I was living the stereo typical mid 30’s lifestyle. Going to work at a desk job, coming home, doing your day to day rat race, and getting your kids to their activities, etc, etc… Life is busy and finding time to work out is always a struggle, and it takes real commitment to create the time to look after your health. Jon and I joined on a Wagjag deal at the end of October 2015 and became members in November 2015, so we have been members for approximately 15 months. Kristina: To be honest, I needed something to help “save me” so to say. The Wag Jag deal presented itself and I ran out of excuses not to try it. I had heard many positive things about the program, but always came up with a reason not to do it. This time I knew that things needed to be different. So I signed up and made Jon sign up with me as I was too nervous to attend alone. Actually, I believe that I told him that since he helped make me get fat, he was going to help get me skinny again! After the first class, I was hooked. I loved how alive my muscles felt! And from then on, we made the decision to attend regularly and have yet to stop working on ourselves. Jon: Kristina wanted to get into better shape, and I wanted to support her in her health goals. I was also noticing that I too was not in the shape that I wanted to be. I was very active in sports all through my school years and into my mid to late 20’s. However as I reached my mid 30’s I was noticing that my flexibility, balance and overall fitness level was going down quickly. I was also noticing that I my self- confidence and body image was starting to come into play a lot more. Kristina: The same week that we joined Lean and Fit, I had a tragedy strike at work. This tragedy was the last of many that year and instead of retreating and hiding from the world; I went to class that night and worked out my feelings. I continued to go to class and continued to make the changes I promised to myself, to Jon and to my children. I could not give up on me or on my relationships. This was more than just improving me physically. This was about becoming a better mother, wife, daughter, and friend. It was to improve my relationships with those that I love and to improve my relationship with myself and with food. So now, almost 15 months later, I am 25lbs lighter, 19 of those pounds being fat mass and I am no longer on medication to control my thyroid. Although there are times that my joints ache, overall, I have come a very long way in my movement, flexibility, and strength. We are also teaching our children that health is important, physical activity is necessary and that you need to take care of yourself in order to take care of others. Both my boys enjoy going with us and have learned how to work out along side us and we love that! Jon: In the year that I have been doing this program I have lost around 25lbs and am back to my highschool and early 20’s weight. My flexibility and balance is back to feeling normal again, and my fitness level makes me feel like I could get back into sports again and not have to worry. 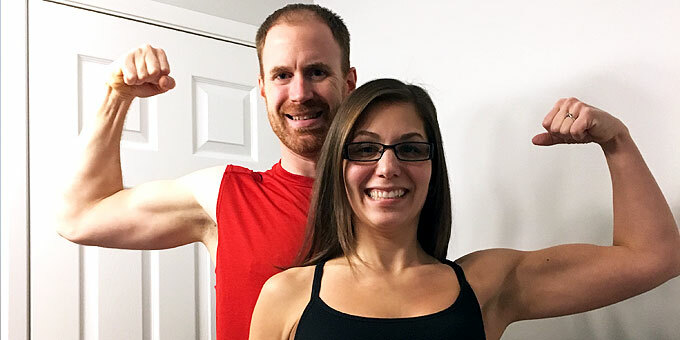 Kristina: As I have mentioned above, I had been struggling with my thyroid for years prior to attending Lean and Fit and after 15 months, I have been taken off my medication as my doctor feels that my thyroid has returned to somewhat normal function! The Endometriosis ended in a full hysterectomy this past July, but otherwise, I am physically healthy and doing a lot better than I ever imagined. I continue to work on my struggles with PSTD alongside professionals, but attending class is a part of my treatment and has assisted me in creating healthy coping mechanisms. Jon: No immediate health issues that I know of, but I do feel better about myself and my body image and self-confidence is much better. Kristina: My friends and family are impressed with my physical changes but are more impressed with the changes to my mental health and self- confidence. They are happy to see that I am calmer, have more positive ways to cope with stress and have taken the opportunity to take care of myself. Jon is also happy with the changes that I have made and the positive impact it has had on our family. I am very grateful for his support and very proud of all the changes and gains that he has made as well. Jon: Most of my friends and family would say that I wasn’t that big or that unhealthy to begin with. Being 6’1”, I could carry the extra 25 lbs and not be seen as being heavy or unfit. Kristina is happy with my weight loss and improved fitness, just as I am with her and her gains that she has made in the last year. We started by doing a 21 day program. If you are thinking about joining, the promotions are a great way to try the program. Just be honest with yourself and give it the full 21 days before you make a decision to stay or to try something else. Kristina: Not only have I met new friends, but it seems like we have created a new community for ourselves. We have a support network of people who appear to genuinely care about our well-being and the well-being of our children, which means the world more to me. Jon: I have met a lot of wonderful people at Lean & Fit and I look forward to seeing them every class I go to. Kristina: The staff at Lean and Fit are truly amazing! From the wonderful staff greeting you at the front door to the instructors running the classes, there is always a smiling face around. Due to our schedule, we usually do classes with Jeff and Josh and have created positive relationships with them. However, we have also formed positive relationships with Boban, Deb, Corey, Corey, Kristine and most recently are building a relationship with Shawn. As a female, it is wonderful to be able to connect to a female instructor and Deb has been nothing but supportive and encouraging throughout my journey. And there’s Eden, a very wonderful young man who is always willing to help and listen! Jon: There are wonderful people working at Lean & Fit, but a few that stand out to me are Jeff, Josh, and Boban. That doesn’t mean that the other instructors there don’t impact me, but these are the ones that I communicate the most with. Kristina: Now that I have had a taste of what I can do, I want to do more because I know I can. I want to continue to build muscle and lose fat mass, but more importantly, I want to continue to build healthy and happy relationships with others as well as continue to be the best possible me, for me! Jon: My future goals are to stay healthy and active.